Editor's note: You can also read how classmates unite to help Haitians from the Spring 2010 Response. Alumna Hillary Prag shares about her time in Haiti and offers photographs of Haiti taken by her photography students before and after the earthquake. Also available are photos taken within hours of the earthquake by Arron Swenson '92. 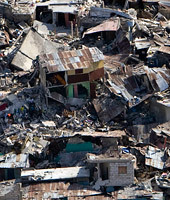 And if you know of any Haiti update, share it here and read others' updates. When the devastating earthquake struck Haiti on Tuesday, January 12, 2010, Seattle Pacific University alumni were there, serving and working in numerous capacities. Several had lived there for years. In Spring 2005, Response readers met SPU alum Trisha Koorn, who told readers why she began teaching in Port-au-Prince, Haiti, soon after her 2000 graduation. Ten years later, the young alumna was still there teaching fourth graders at Quisqueya Christian School. Now married to Tarek Zakhour, a Haitian-born Syrian, Koorn Zakhour and her husband welcomed infant son Lucas in late December. According to Trisha Koorn Zakhour’s father, Marvin Koorn, when the 7.0 earthquake struck, his daughter was home — in the ground-floor unit of a five-story, five-unit apartment building. Visiting with guests who'd come to see the baby, Koorn Zakhour, the baby, and her friends escaped the building when the shaking began. The building remained standing but wasn't considered structurally sound anymore. Her husband, who managed a local grocery store, was in his office when the earthquake began. Customers and workers raced outside, but because his office was in the back of the store, he was still inside when the building collapsed. He did, however, crawl out once the quake stopped. The grocery store was reduced to rubble. The chapel housed a temporary surgery room. The basketball court became a hospital. The soccer field became home to staff and other workers; a playground is became home to orphaned children. The school also hoped to be a food and water distribution center. Update, March 09, 2010: On Wednesday, January 27, classes resumed amid the relief efforts continuing on the campus. In the days following the earthquake, according to Koorn, his daughter’s young family stayed with her husband’s sister, along with other family members, in a house farther from the devastation. But the couple is also actively seeking to travel to the Dominican Republic, and from there fly to her parents' home in Oark Harbor, Washington. At about 7 p.m. on Saturday, January 16, Koorn Zakhour and her family arrived in the Dominican Republic, says her father. They went to the U.S. Embassy on Sunday, and made arrangements to fly to the United States. Our thanks to the multiple sources, including Laila Olsen Sharpe '73, associate director of Alumni and Parent Relations, who helped bring this information together. Lars Rood '94 is in Haiti serving in the recovery efforts with a team of nine other youth ministers. According to Rood's wife, Danielle Rood, her husband was invited to go with Adventures in Missions as the short-term mission team's blogger, helping keep those following the trip on Twitter and Facebook up-to-date on the relief efforts and ways they could help. "He first went wondering how he would help, since he has no medical training, but has his M.Div. from Fuller and a doctorate from George Fox Seminary," says Danielle Rood, adding that before he left, families in their church, Highland Park Presbyterian Church, as well as their son's third grade class filled four suitcases and duffle bags full of supplies: hygiene products, sheets, baby bottles and formula, and protein bars. The Jedediah Clothing Co. donated T-shirts. Then on the fourth day of the week-long trip, Rood and the team came across a tent village of 5,000 that had not received any aid since the earthquake — neither medical nor food aid. "They starting blogging like crazy, twittering messages to CNN, Fox, Adam Housely, Anderson Cooper, with their geographical location to get noticed and help to these people," says Danielle Rood. "And they mobilized the church in America through the use of Twitter and Facebook to pray for help for this village." Because the tent city had been create in a ravine, vulnerable to the rain and flood water expected in the coming month, the team felt a sense of urgency to help. "Well, God was good and answered," continues his wife. "What began with a worship service, ended up a healing service, and a van full of Cuban doctors, nurses, and nuns just showed up at the camp." Some of the members of the mission team were also able to get the tent city registered with the United Nations so it could receive aid. They then purchased $2,000 (from American donations) on rice and beans, and such, to fill their immediate food needs. "God used this team of 10 people to help fill the immediate needs of a village of 5,000!" she says. "He used these 10 people, including one SPU alum, to help a displaced people — a true loaves-and-fishes story." To read more about Lars Rood and the missions team, visit www.facebook.com/ymath?ref=ts. You can also follow them on Twitter @ymath. Writes Arron Swenson '92, "I head back to Haiti tomorrow (February 26). We hope to have the new rig in and start drilling wells in the tent cities." See Swenson's photos of the day of the earthquake, and the days soon after. Arron Swenson '92 is pastor of Cornerstone Community Church in Pendleton, Oregon, who was working in Haiti at the time of the earthquake. He and others dug out Katie Zook from the rubble, and he writes: "I am a Free Methodist pastor who was leading a well-drilling team in Haiti. We were actually drilling a well at the time of the quake. I had to take my six first-timers to Haiti back into Port-au-Prince to check on our people. The FM guest house where we were staying had collapsed, killing four and burying our personal stuff, including passports. "We spent the night digging out two missionaries and then stayed in the street in our trucks. We assisted neighbors retrieve some of their people too. In the schoolyard below, they sang and prayed all night — just getting louder at every tremor. Job 1:18-22, 2:10 and the last four chapters are something that several of us have been hanging onto. It is just plain yucky to live in a fallen world but Christ, his people and his Church are strong, especially in Haiti right now!" For more details, visit cnrstone.org. Corrigan Clay ’00 and Shelley Monoghan Clay '00, are co-founders of the Apparent Project, a nonprofit organization providing artisan training to produce a sustainable income, and an orphanage that facilitates adoptions. When the Clays first arrived in Haiti in 2008, they were the house parents for an orphanage of 24 boys. Writes Corrigan Clay in the weekend after the quake: "Thanks so much for posting about us SPOOers in Haiti. I have not heard from Stephanie either. Please let me know if you find anything out. We all had dinner together not too long ago. I hope some SPRINT trips can come help with the aid. We'd love to see some more falcons in the trenches. I just posted a blog at apparentproject.blogspot.com." As a rule, says Woodward, "it makes more sense to donate goods if they are used, or if someone has access to a large, cheap supply that isn't available by retail. We can go to Walmart here to buy standard retail-priced goods, so it would be more efficient to send money to us than to ship goods purchased at retailers." Another relief trip will be made in June 2010. To make a donation for either trip, contact elkgroveforhaiti@gmail.com. Or to make a donation in the Seattle area, contact Professor of History William Woodward at woodward@spu.edu or 206-281-2163. Kurt Hildebrand '00 is the head of the Mennonite Central Committee (MCC) in Port-au-Prince, helping the populace with disaster relief and development assistance. Soon after the earthquake, he told family and friends, "I feel very supported, though I have no idea what I need right now." In the MCC guest house when the earthquake hit, Hildebrand made it outside safely and immediately began to help other MCC staff people find their families. He then traveled by motorcycle to the American Embassy in Port-au-Prince. Says his mother, “No one slept in a building last night, he said. Everyone is too afraid to take shelter, so people are sleeping in the streets everywhere in Port-au-Prince.” His next task, he told her, was to account for all of the rest of his staff, especially the nationals that he hadn’t seen yet. Brooke James '03 works with Child Hope International, a charitable Christian organization dedicated to rescuing suffering and abandoned children in the capital of Port-au-Prince. She assists in the orphanage of Maison de Lumiere (The Lighthouse). Child Hope reports all staff and children safe, but they are running low on medical supplies. Their schools have suffered severe damage. Of Brooke, they write, "Brooke and Ashley, our nurses, haven't stopped. I know they're tired, but they go from one person to the next. It's been a blessing to see them do what they do, be stretched, and continue to smile, even after a good cry." Katie Zook, although not an SPU alumna, has strong SPU ties. The Arlington, Washington, native is the daughter of SPU alumni Pastor Greg Zook '83 and Dawn Flohr Zook '81, Zook was one of 17 Free Methodist missionaries in Port-au-Prince, three of whom remain unaccounted for and are now presumed dead. Her brother, Andrew Zook, is part of the SPU worship team. Zook, age 22, was on the top floor of a five-story building when the earthquake struck. The building collapsed, and she was trapped for several hours. She sustained numerous injuries, including to her chest and spleen. After being treated by a U.S. physician, she was flown to Guantánamo Bay, Cuba, and then to Florida, where she is now recovering, but still in serious condition. Do you know of any SPU-Haiti news update? Share it here. Response will post updates here regarding SPU alumni in Haiti in this moderated board. Posted November 2, 2010, at 11:03 a.m.
Dr. Thoburn, Dr. Kira Mauseth (2008) and Stacy Cecchet (current student in clinical psychology) returned from Haiti last week. Among the highlights, Dr. Mauseth and Dr. Thoburn trained over 200 Haitian volunteers and relief agency staff in the Help Support Team psychological first aid curriculum. Stacy performed psychological assessments and referrals for female assault victims (a growing trend in the tent cities) and worked with the medical clinic in two orphanages outside Port au Prince. Posted January 25, 2010, at 10:01 a.m.
Posted January 23, 2010, at 11:46 a.m.
Hello, My name is Jocelyn MacGregor and for the past three weeks I have been with Corrigan and Shelley Clay, two SPU graduates who've been working in Haiti for the past 18 months. We were in Haiti together during the earthquake and I've been keeping a journal of the events since that day. Posted January 22, 2010, at 1:37 p.m.
Corrigan & Shelly Clay, class of 2000, posted a blog on their website which gives great background information to what is happening on the ground in Port au Prince, apparentproject.blogspot.com. The Clays are providing food and medical help from their home.